Well, not quite. There is good news. But there’s also not-so-good news. 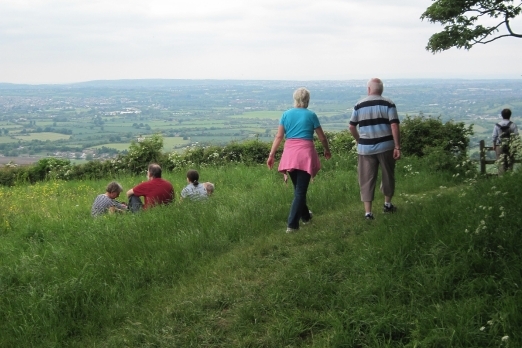 Arup, the consultants, have produced a Green Belt Assessment for the Council. It can be read in its entirety at https://spelthorne.gov.uk/article/13703/Green-Belt-Assessment . It is worth reading, particularly if there are parcels of Green Belt in your part of the Borough. The study is not – yet – policy, a point which the Planning Officers at Spelthorne have been keen to make. There is further work to do in identifying which bits of Green Belt to protect, and which to abandon to developers. A public consultation on Issues and Options is due to be held in the spring of 2018 where this further work will be unveiled. Nevertheless, one can easily imagine a developer’s barrister latching on to anything in this document which serves their desire to cover the entire south east in concrete and tar, as well as arguing vociferously and repeatedly against anything which does not. Each parcel of land is rated as either Strong, Moderate or Weak in terms of fulfilling these five purposes. These ratings can be seen on the following map (click here or see page 54 of Chapter 5). Each parcel of land is allocated a number on this map. 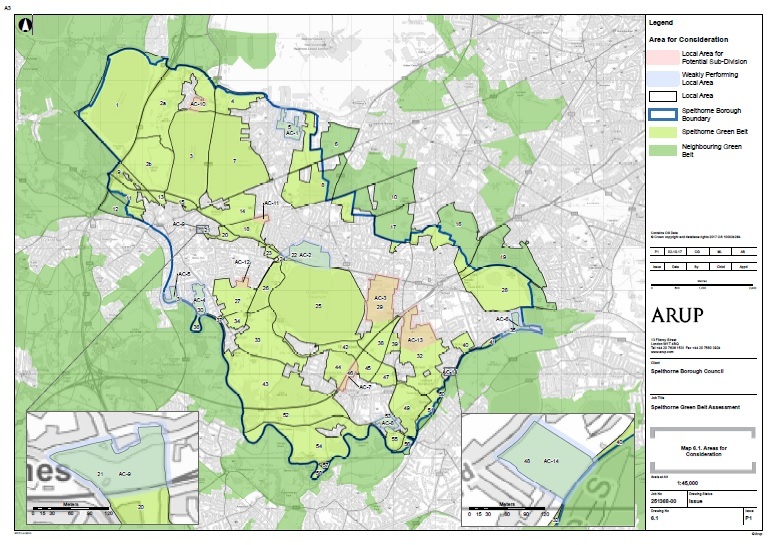 An explanation of how the rating for each parcel of land was arrived at can be seen in Annex Report 2 – Local Area Assessment Pro-formas at https://spelthorne.gov.uk/article/13703/Green-Belt-Assessment . But that is not the end of the story, about which more below. The good news is that the whole of the Kempton Park estate has been rated as Strong. The not-so-good news is that there are areas in Sunbury which are rated as Moderate or Weak – many of them open spaces that are very well used, and highly valued, by residents. Sunbury Park, for example, is rated only Moderate. And Sunbury Cricket Club is rated Weak. And the other not-so-good news is that even land rated as Strong does not have protection. See Map 6.1 (click here or see page 80 in Chapter 6 ). Area 32 is rated Strong, But that part of it north of Stirling Avenue, Park Avenue and Croysdale Avenue is recommended for sub-division and development. There are other examples in Sunbury, and elsewhere in the Borough. Finally, there are other areas of open space which do not enjoy Green Belt Status. They have the lesser protection of Protected Urban Open Space. The old London Irish ground was such a site. As we found out, it turned out to be Unprotected Urban Open Space, and is now covered in 230-odd houses. How does the Council intend to keep other such areas safe from developers? The current council leadership has been very public in stating its intention to protect the Green Belt in Spelthorne. But there are Councillors – no names for the moment – who would happily see Green Belt developed, particularly if there is money involved for the Council. The test will come next Spring, when we see what Issues and Options the Planning Officers put before us. As part of the Review of our Local Plan, the council is required to undertake a Green Belt review. Part of this Green Belt review is an Assessment compiled by Arup, the engineering consultancy. The LPWP has forwarded this Arup Assessment to the Council cabinet meeting on 22 November, for them to decide whether and when to put this Assessment in the public domain. On the assumption that it would be extremely difficult for the Council not to make it available – other nearby Boroughs have made their Green Belt Assessments public – we will publicise it as soon as we are able to. * KKG won an appeal to the Information Tribunal, against the Information Commissioner and Spelthorne Borough Council, who both said that the Council was entitled to keep the proceedings of the LPWP confidential indefinitely. The Tribunal judge disagreed. “ Spelthorne Council’s own rules as to access to meetings contains nothing that entitles them to exclude members of the public from meetings of the LPWP. As we have come to expect, however, the LPWP would not accede to what we think is an entirely reasonable request. 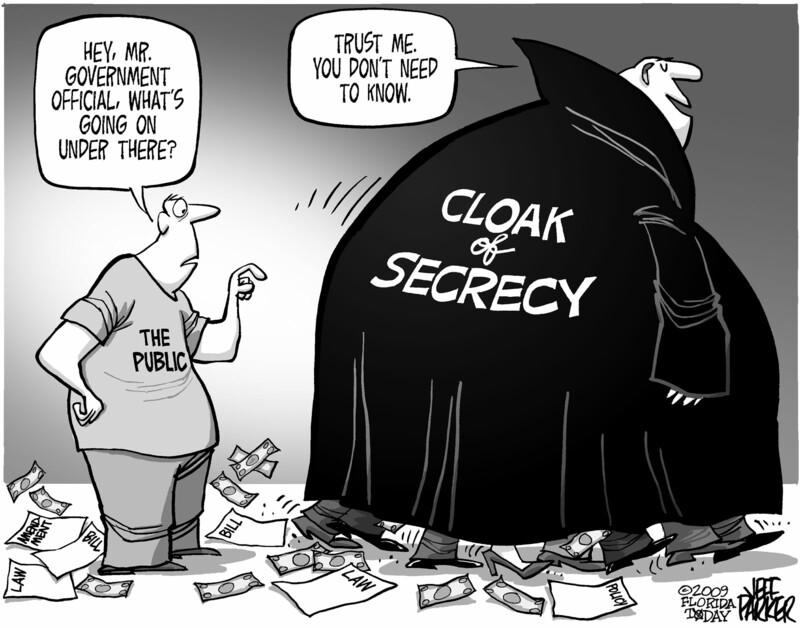 Secrecy, as the denizens of Westminster are finding out, breeds suspicion and contempt. This is not the end of the matter, We’ll keep you posted. One in ten British adults now owns a second property, research has found. The figures published by the Resolution Foundation show that the number of people with multiple properties rose from 1.6m to 5.2m between 2000 and 2014, a 30 per cent increase. The analysis also suggested that most of these owners are not landlords, with just 3.4 per cent of adults letting property out. This would mean that 6.6 per cent of adults, or 3.4m people, have extra properties that they leave empty as an investment or use as holiday homes. The think-tank examined data from the British Household Panel Survey and the Office for National Statistics to find that while overall home-ownership has plummeted, second home-ownership has risen dramatically. The proportion of adults owning any property rose to a high of almost 66 per cent in 2002 but has since fallen to just over 60 per cent. Laura Gardiner, senior policy analyst at the Resolution Foundation, said: “Multiple property ownership is still a minority sport, but a growing one that represents a significant boost to the wealth pots of those lucky enough to own second homes. People with second homes not only have an investment that they can turn to in times of need, for instance in later life when care is required, but if the property is rented out they also see a boost to their incomes here and now.” She added that properties not being used for rental could include “holiday homes, flats that adult kids live in for free, empty properties they’re speculating on, MP’s with London flats and constituency houses, people who’ve inherited their recently deceased parent’s home and haven’t worked out what to do with it yet”. Last year the Cornish town of St Ives voted to ban the building of second homes. The town, dubbed Kensington-on-Sea because of its popularity with well-heeled west Londoners, held a referendum last May after figures revealed that one in four new properties were being used as second homes. A judicial review of the plan brought by an architectural firm failed in November. Housebuilders have been charging a premium of up to 5 per cent for homes sold using the government’s Help to Buy equity loan scheme, adding extra obstacles for those who want to move up the housing ladder, according to a new analysis. 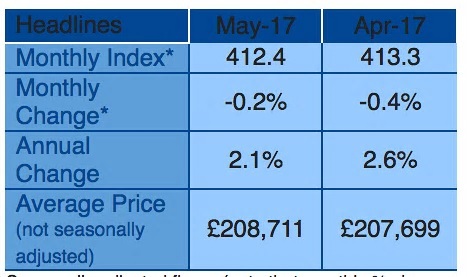 Prices for homes sold under the scheme have been rising faster than the wider market, with other new-build homes effectively cheaper thanks to incentives such as price discounts, according to the analysis by broker Stockdale Securities. Help to Buy, the flagship housing policy of David Cameron’s government, enables people to buy new homes with deposits of only 5 per cent, using an equity loan from the government for 20 per cent of the home’s value outside London and 40 per cent of the home’s value in the capital. But critics argue that the scheme, which has supported more than 120,000 house purchases since 2013, has boosted margins and profits at housebuilders without reducing pressure on Britain’s stretched housing market. Buyers already pay a so-called “new build premium” to live in a brand-new home with unused appliances, which on average amounts to 17 per cent of the home’s value, according to separate findings by estate agents Countrywide. 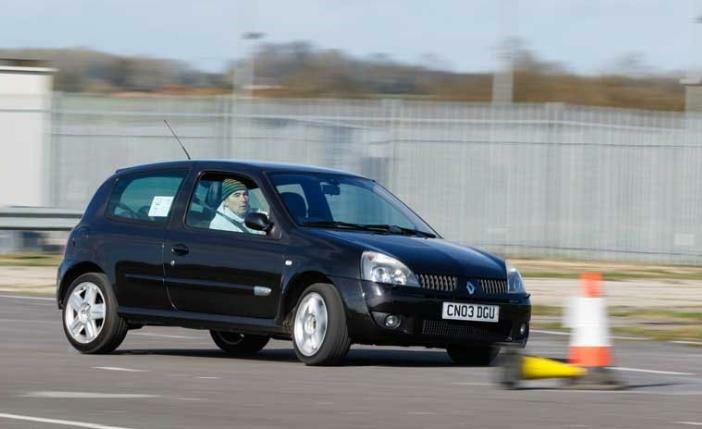 But the boost begins to diminish as soon as the buyer moves in and starts to create wear and tear on the property. Countrywide found last year that buyers using Help to Buy in the early years of the scheme were only half as likely to upgrade to a new home as the average first-time buyer. When the need to save a larger deposit is taken into account, many Help to Buy purchasers will find themselves “prisoners” unable to step up the housing ladder, Mr Stewart said, because vendors must pay the government back the equity loan as a proportion of the home’s sale price, while mortgages for 95 per cent of the value of a home are difficult to obtain for “second steppers”. “What we consider almost totally inconceivable is the concept of the majority of buyers under London Help to Buy ever amassing the levels of equity required to move to a larger home in the capital,” Mr Stewart said, adding that the costs of a deposit, stamp duty and other charges for such a move would amount to almost £100,000. 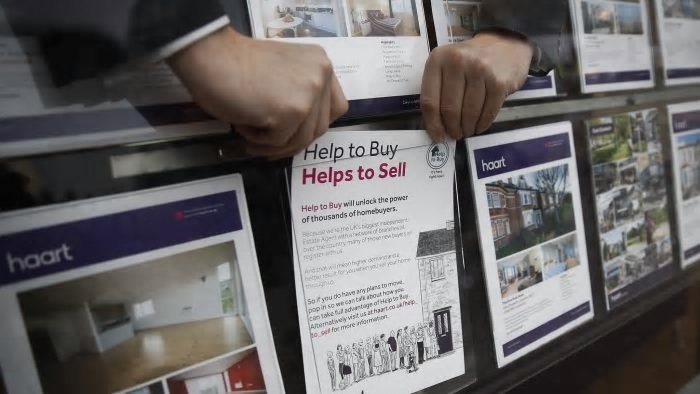 In weaker housing markets in the north of England, the so-called “Help to Buy premium” is greater, Mr Stewart said, adding buyers may risk negative equity if underlying markets do not rise. The Stockdale research comes as government ministers consider whether to continue Help to Buy after its current scheduled end date of 2021. Many housebuilders are lobbying for the scheme to continue, but have braced for it to be tapered over time. A report that it might end early — subsequently denied by the Department for Communities and Local Government — briefly sent housebuilders’ shares down as much as 5 per cent last week. But some companies have broken ranks to criticise the scheme. Rob Perrins, chief executive of Berkeley Group, has called it “inflationary”, while Jolyon Harrison, chief executive of Gleeson, which builds low-cost homes, has said the price ceiling for houses bought through the scheme should be reduced. David O’Leary, policy director at the Home Builders’ Federation, an industry group, said a shift towards selling houses rather than flats accounted for some of the apparent price rises under the scheme, together with the later introduction of the London version. “Help to Buy has allowed the new build sector to buck the trend in the wider housing market, where transactions have been pretty sticky, and also helped first-time buyers to sustain the same sort of presence in the market,” he added. 5/10 to the CPRE for this, because it is only half the story. The price of a house is driven by a number of factors – house prices can go down as well as up. At the moment, the Bank of England’s ultra low interest rate policy has forced the price of all financial assets, including houses, into a stratospheric bubble. The problem is not deficient supply: it is hugely excessive demand. More and more research into the housing and rental markets is showing that this is the case. You could concrete over the entire south east of England, including the Green Belt, and under the current monetary policy regime there would not be any reduction in house prices. This is because credit is so cheap that demand is, in effect, limitless. The developers know this damn well. Yet they continue to argue that there is a shortage of housing – because it is in their interests to do so. The sooner politicians stop listening to these weasel words, the better for all of us.